Photo of Erykah Badu by Leon Laing. This past Friday wasn’t so good for Erykah Badu. On Good Friday, (April 5), the Dallas Police department charged Badu for disorderly conduct for her new video. The po-po also fined her $500. Since 1997, Badu has been changing the game with her left-of-center music. If you haven’t seen her new video for her single “Window Seat,” you gotta check it out. Inspired by Matt and Kim, the singer continues to push the artistic envelope by disrobing in public. 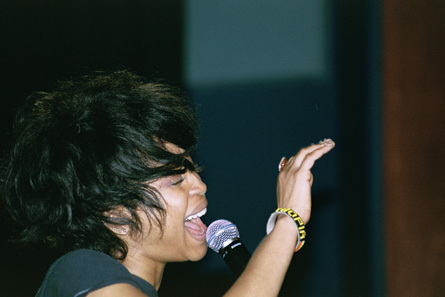 Some of the songs she sang included “Appletree” and “Other Side of the Game.” During her unforgettable performance of “I Want You,” the Grammy Award-winning songstress showed her artistic side by going back and forth between sensual singing and playing old-school hip-hop beats on her drum machine.